A similar product in concept to Waterguard but developed specifically for use with solid screed and concrete floors in wet room showers. Screedsafe forms an impermeable barrier to water preventing moisture from soaking into the floor and causing dampness. A damp screed floor is something to be avoided at all cost as screed is normally protected from below by a damp proof membrane which traps the saturating moisture, effectively preventing the floor from drying. A saturated floor will result in unpleasant odours and degradation of the floor structure. Tanking membranes work happily with electric under tile heating providing you don't exceed a heat output rating of 100 Watts/m2. While enhancing the ambience of your shower room or bathroom, a warm floor also speeds up the floor's drying time which improves safety and prevents dampness and odours associated with the growth of mildew. Available in two sizes. 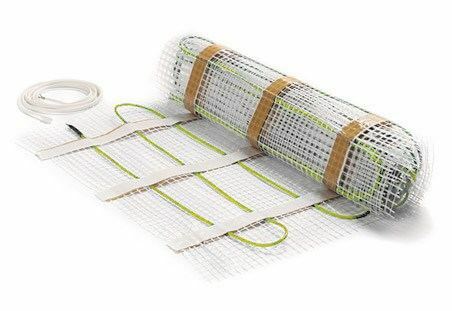 The membrane is supplied on a roll measuring 1 metre in width by either 5 or 10 metres in length. The kit includes the necessary primer and jointing tape required to effect waterproof tanking of the screed floor in and around the wet room shower area. When used in conjunction with either Tilesafe or Wallsafe you can completely protect the walls and floor of your shower area from the threat of leaks and dampness. Suitable for solid floors only. For timber floors see Tilesafe or Waterguard. Delivery charge: Delivery on this product shall be free when ordered with a Novellini Linear Floor or Linear Wall drain for screed floors. If ordered separately and delivery is payable. It has come to our attention that some suppliers are cheating by offering Screedsafe at low low bargain prices then supplying a substandard lookalike. "Screedsafe was out of stock so a suitable alternative was sent." Please consider carefully before taking a chance with your installation. It's not worth the gamble. If the lookalike product you install does not perform it is not a simple case of swapping it for something that does! Screedsafe is at the heart of your wet room shower. Please advise us if you encounter 'cut price' offers, we should be the cheapest place in the UK for the genuine product.